Knowing how to clean a spinning reel is one of the most important parts of owning it. Reels need cleaning regularly, and some choose to clean their reel and rod after every session of fishing. Whilst this isn’t totally necessary, it does need cleaning at regular intervals in order to keep everything working to the optimum levels and ensure that your reel lasts as long as possible. 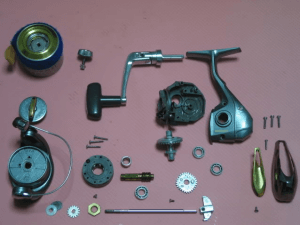 For a beginner, it can be hard to understand the different parts of a reel, how to clean a spinning reel, and what you need to use in order to do so. To help you out, and make it a lot less confusing and stressful, we’ve put together some tips for cleaning and maintenance so that you can keep your reel working as well as it possibly can, and keep it working for as long as possible, so you don’t have to go out and keep buying more once one has rusted and is unusable. We hope that this article helps you to understand how your reel works, and what you need to do in order to clean and maintain your reel for as long as possible, saving you confusion, time, and money. The first step is to get all of your tools together and organised, as well as he space you’re planning to clean your reel. You’ll need some tweezers, a Phillips screwdriver, two screwdrivers and a wrench if possible. There are a lot of complex parts and machinery inside a reel, and this can get complicated during cleaning. To help yourself to keep from misplacing or losing parts of the reel during cleaning, organize your tools and supplies on the surface you’re planning to clean on so that you can keep everything together and make it easier to put your reel back together once you’re finished. Keep your reel in your non-dominant hand and work with your dominant hand. This makes it much easier to organise the parts of your reel as well as the tools you’re using in order to keep everything together. Make sure to hold it in the correct position so that you can clean everything properly, this will make it much easier to disassemble your reel and put it back together once you’re finished. As well as the basic tools, you will also need hot water, some cleaning fluid, lighter fluid, grease, and reel oil. These will help you to clean your reel properly and thoroughly. It is important to clean and re-oil your reel in order to keep it working at its best for as long as possible. Do not use household oils and greases, because these harden much faster than the specialist products, and this will cast a crust and crud on your reel. Things like WD-40 won’t give you at all the type of protection and performance that you require, so you are better to just use what it recommended for your reel from an actual reel manufacturer. Don’t put metal against metal when cleaning your reel. It is important to use fibre cloth or sponges in order to make sure that you do not mark or damage any parts of your reel. This will keep your reel clean and working well, whilst making sure that it lasts. 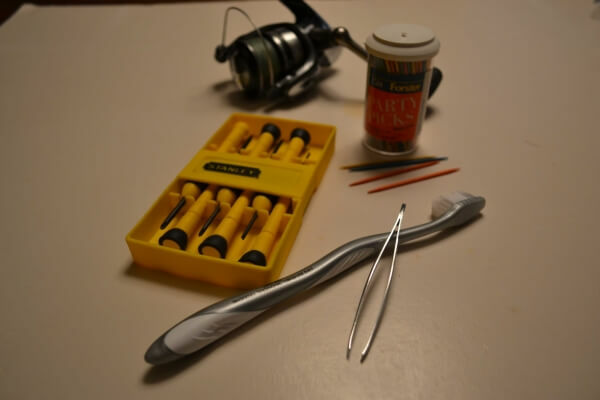 Using tweezers on spring loaded and turning parts can help to keep them still and stable in order to get a thorough and proper clean for your reel. 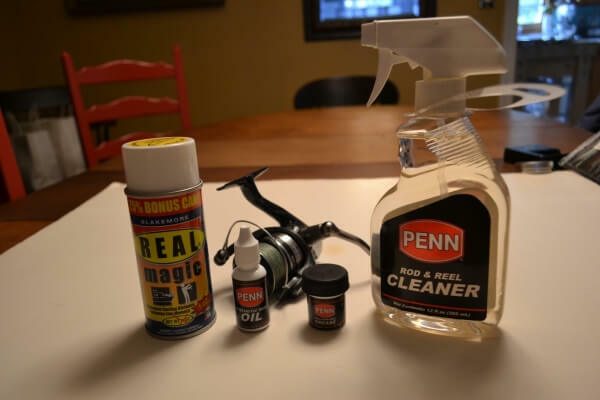 This isn’t totally necessary, but it makes it a lot easier to clean the more intricate parts of your reel, especially if you are a beginner to fishing and cleaning your reel and rod. Before cleaning, you should either remove the line completely for a deeper clean, or secure it with a sticky tape so that the line doesn’t get stuck in the mechanisms, which can be hugely detrimental to the spool should this happen. It is recommended that you remove the line completely during cleaning, as this removes the risk of damages, and allows you to clean all areas of the spool without any obstruction. Believe it or not there is a knack to greasing the spool. You should always start from the bottom teeth of the spool rather than the top, and then work your way up. If you start from the top you run the risk of the grease not sticking, running down the spool, and making a huge mess. Start from the bottom teeth and work slowly, using a toothbrush and small amounts of grease to ensure that the grease sticks to the spool. This will keep the spool working perfectly and increase its longevity. If you use your reel for more salt water fishing than fresh water then it is recommended that you soak your spool in clean, fresh water after every use and stray your rod with fresh water in order to keep up the lifetime of your reel and spool. 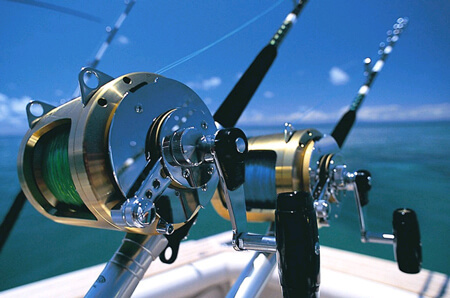 Salt water can cause parts of your rod and reel to corrode and rust, which can be irreparable if you are not cautious. When you’re not using your reel and rod, it is important to put them in a reel bag or a flannel bag, as these are specifically designed to absorb water and moisture. This moisture can cause damage and rust to your reel, so it is important to make sure that your reel will stay as dry as possible while it is not being used. Many reels and rods come with their own bags that are commonly thrown away. You should keep these bags and use them to store your reel on the offseason, as the manufactured bags are the best for storing your reel and rod, and keeping the moisture out. Spinning reels and conventional reels are cleaned pretty much the same way. Although they are different in their weights and moving parts, they still need cleaning just as regularly and the same way as each other in order to keep both types of reel working in the right ways for as long as possible. There are several areas that require a more thorough and regular cleaning, and this is because of the fact that they are moving parts or because they are load bearing parts. Parts such as the support arm, the bail and bail arm, and the spool all need regular maintenance and cleaning in order to keep the spool working at the optimum levels. As well as cleaning, you there are also a few things you can do to keep the life of your reel as long as possible, which don’t involve cleaning the separate parts. It is important to always back off the drag when the reel is not in use. This removes any unnecessary pressure on the reel when it is not being used, making the reel much more proficient at dealing with pressure for a much longer time. When you’re storing your reels you should cut off any old or used line so that all pressure is taken off of the reel during the offseason. You should also protect and lubricate all of the moving parts so that they don’t rust or jam when you come to using your reel when the season comes around again. Many separate the reel from the rod when storing the reel on the offseason, however this is not absolutely necessary and the reel can just as easily be stored on the rod without any risk of damage. When the season rolls back around you should remove your reel from the moisture-proof bag and carefully test the spool to make sure there are no snags or rusts, then clean and ensure that there is enough lubricant and grease on the reel for proper usage. Once the reel has been initially tested to ensure there are no issues, and carefully checked to ensure there are no damages it can be used for fishing all season with careful and regular cleaning to keep it in top condition for optimum fishing. Looking after your reel is massively important in keeping your reel working as well as possible, and keeps it working for a longer amount of time, so that you can get the most out of your reel and the best value for money. Knowing how to clean a spinning reel regularly during the fishing season is imperative to keep the reel working at the optimum levels in order to get the best catches without any rusting, catching, or jamming in the reel during a catch. On the off season it is even more important to take good care of your reel when storing your reel and preparing your reel for storage in order to be able to use the reel as soon as the season comes back around. We hope that this article has helped you in order to understand your reel properly and look after it in the proper ways so that you can get the best performance and longevity out of your reel as possible. If you take the proper care of your reel you will get the best results and the best longevity so that you can enjoy your reel for as long as possible, and catch as much fish as you can. Happy fishing!